BVG Health Food Maharashtra (BVG Health Food Pvt Ltd), Maharashtra Published Job Notification for Area Sales Manager & Sales Executive Posts. 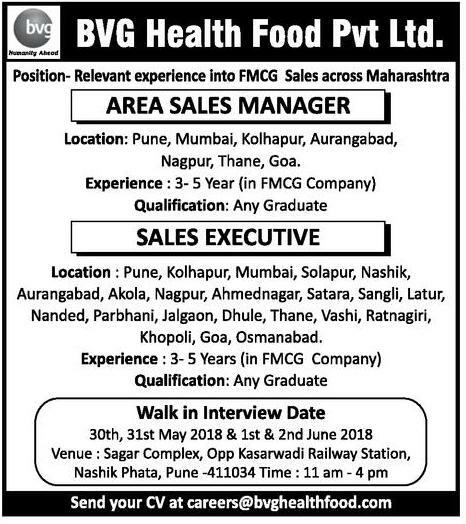 Candidates who wish to apply must look at BVG Health Food Maharashtra Area Sales Manager & Sales Executive Recruitment 2018. Eligible candidates can join Walk-in Interview on 30th May to 2nd June 2018. Interested & Eligible candidates may attend for walk in interview along with all the documents addressed at Sagar Complex, Opp Kasarwadi Railway Station, Nashik Phata, Pune -411034. Starting Date, Last Date to Apply Offline at BVG Health Food Pvt Ltd which candidates should be remembers as follows. Walk-in Interview on: 30th May to 2nd June 2018.